In terms of skin care, for me, Spring is all about reviving and brightening the complexion. Ergo, I try to have some form of illuminating agent in all of my skincare products. 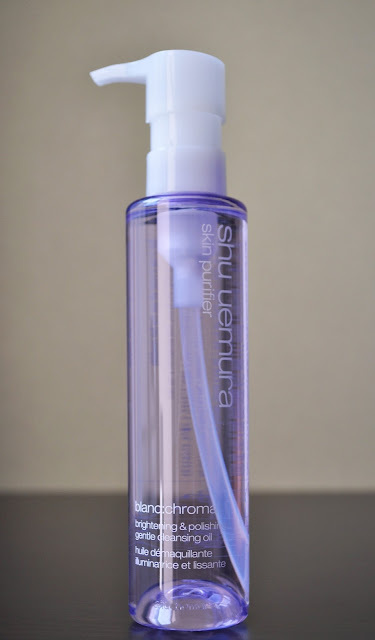 Since its launch, this is my third Spring using the Shu Uemura Blanc: Chroma Brightening & Polishing Gentle Cleansing Oil as part of my makeup removal routine. Let me quickly address how smitten I am with the purple bottle, and how pretty it looks on my side of the bathroom shelf. The Blanc: Chroma Brightening & Polishing Gentle Cleansing Oil has a pleasing, fresh, floral scent. Here are the listed notes: (Top Notes) Bergamot,Grapefruit, Clementine, and slight Galbanun Green Accord. (Middle Notes) Lily Jasmine, Ylang-Ylang, Orange Tree, Cumin, and Clove Leafs. (Bottom Notes) Woody, Cedarwood, Vanillic Accord, and Balsamic Accord. Blanc: Chroma Brightening & Polishing Gentle Cleansing Oil is the first cleansing oil empowered with purifying CLAY-EX. And, what does the Blanc: Chroma promise to do for your skin? This new stage of 4D brightening not only targets melano-stains, but it's also formulated to combat the 4 Chroma imperfections: yellow dullness, uneven redness, greenish skin tones, and brown dark spots. Thus, revealing a more brightened, luminous, healthy complexion. Blanc: Chroma's oil is thicker than the other Shu cleansing oils, and needs more water to emulsify. Also, it doesn't remove my mascara thoroughly like the others. Therefore, my two pumps for the face, and one for the eyes, requires another pump (and extra attention on the lashes) to make sure all traces of mascara are gone. I use the Blanc: Chroma Brightening & Polishing Gentle Cleansing Oil seasonally; but, during this time period, my skin does look more luminous. I'm not sure if it's solely due to this cleanser, or the combination of using the cleanser with the myriad of the other products I use, or maybe it's wishing thinking. Have you tired Shu's Blanc: Chroma Brightening & Polishing Gentle Cleansing Oil? Hello and welcome Hokis 1981!